Dive, Dive, Dive! Click here to play! Join in on the underwater adventure to search for sunken treasure. The San Pedro sunk around 1660 and the myth is she was carrying a great amount of valuable gold and jewels. Dive to the depths of the ocean to find this long lost ship and recover her valuable cargo. Keep an eye on your fellow diver, as he will lead you through the water filled chambers of the sunken ship to reveal your treasure. He only appears on reels 2, 3 and 4, but will substitute for all other symbols to create more winning combinations. He will also double prizes when he appears in winning combinations. That's a lot of loot so be sure to stick close to the diver. Of course, there are plenty of other tools to help you in your quest for sunken treasure. One to five chests will give you 2500 times your line bet and two to five friendly fish will pay out up to 1250 times your original line bet. Plus, there are a plenty of other symbols, including starfish and anchors that will help you collect your treasure. The sunken ship is, of course, where all of the treasure is hidden. These symbols act as scatters and will not only multiply your total bet, but they'll also activate the Treasure Dive Feature in which you can win free games or activate Jewel Pick Feature! 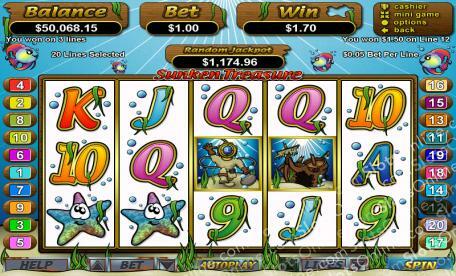 Join the Diver in this underwater adventure and you could surface with plenty of sunken treasure. The sunken ship acts as a scatter. Two to five of these anywhere on the board will trigger one of two bonus features. All prizes will be multiplied by your total bet during the bonus feature. The diver acts as a substitute. He will replace all other symbols, excluding the scatters, and will double your prize if he appears in a winning combiation. There are two bonus games in Sunken Treasure. The first is activated by two to five scatters anywhere on the board. It is the Treasure Dive feature in which you will choose a chest to reveal free games and multipliers. If you pick a chest to reveal a blue or red jewel, you'll activate the second bonus feature. You'll pick from a selection of jewels to get multipliers.